Unconventional interlocking systems inspired by Japanese architecture joinery techniques have been used to create a collection that challenges the conventions of traditional garment making resulting in striking sculptural silhouettes. Three-dimensionally woven wools assembled in varying scales span the predominantly zero-waste cut pieces. 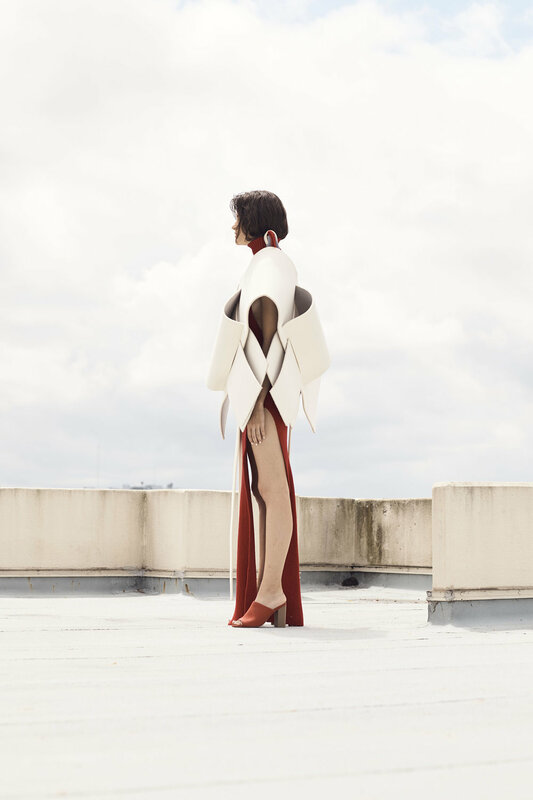 This process of material and surface connectivity explores the possibility to create fashion proposals that eliminate the use of sewing and material wastage. I am proposing that through this method an interactive element and ethical approach to the production of fashion can be introduced to the current system. This collection questions where the conceptual ends and fashion design begins.